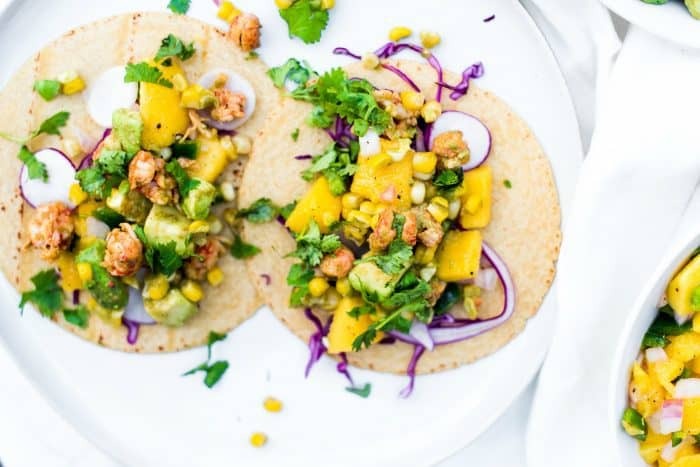 Lobster Avocado Corn Tacos make a delicious, quick meal served with mango salsa. 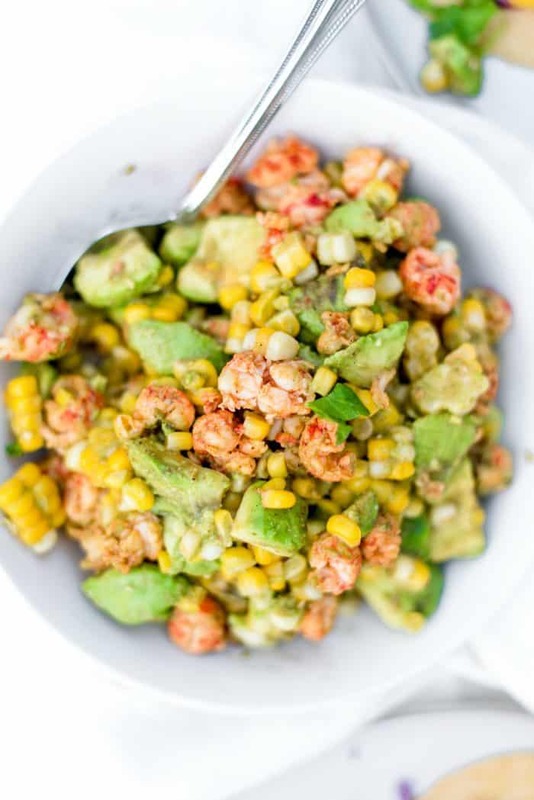 Add fresh corn and avocado to stretch the chunks of taco-seasoned lobster. Happy Taco Tuesday! Abby and I were cooking with lobster a few weeks ago, right before she went to college and we left on our trip to Europe. Stay tuned for a delicious Butternut Squash Coconut Lobster Soup coming your way. 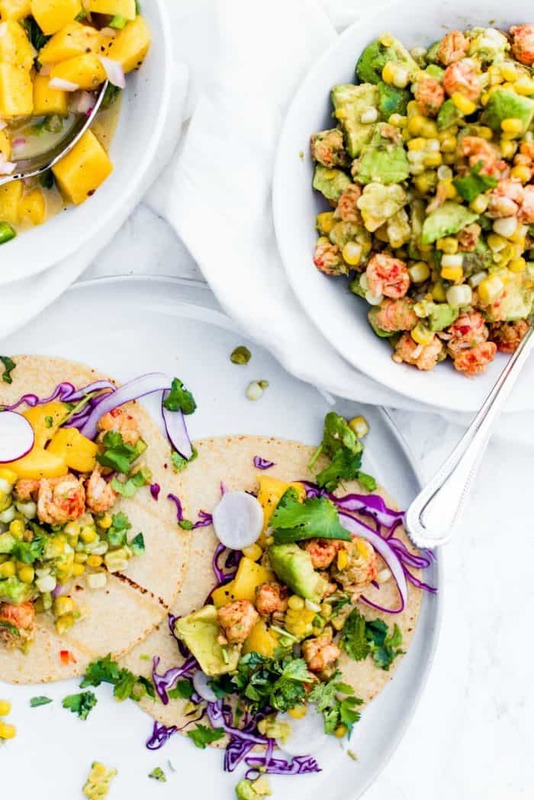 Tacos are often one of our go-to dinners during the week, but these Lobster Avocado and Corn Tacos, are good enough for a weekend taco feast! A little bite of elegance! Abby and I were making tacos together in the kitchen. There’s nothing better than mom and daughter working side by side, that is, if we stay out of each other’s way. HA. 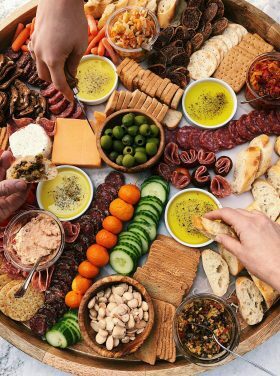 We talk, dice, chop, taste, make adjustments, and plate the food. 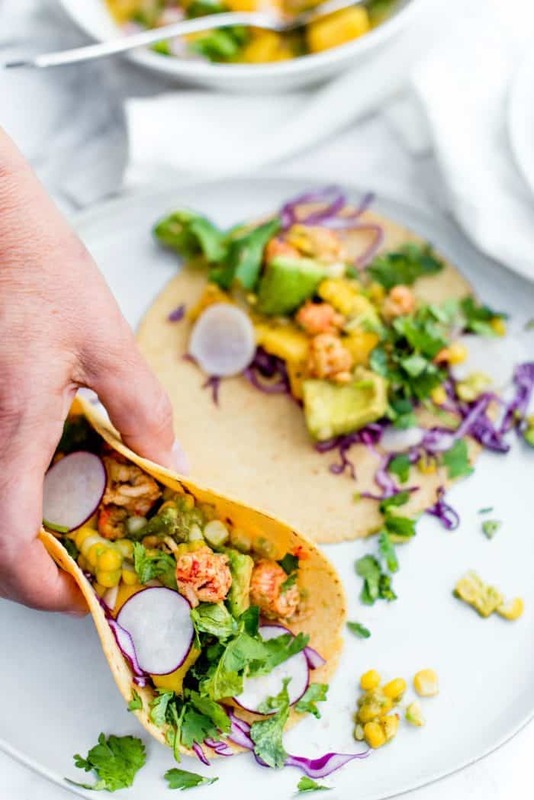 Tacos are easy, really, and the layers of flavor (especially with lobster) are out of this world. 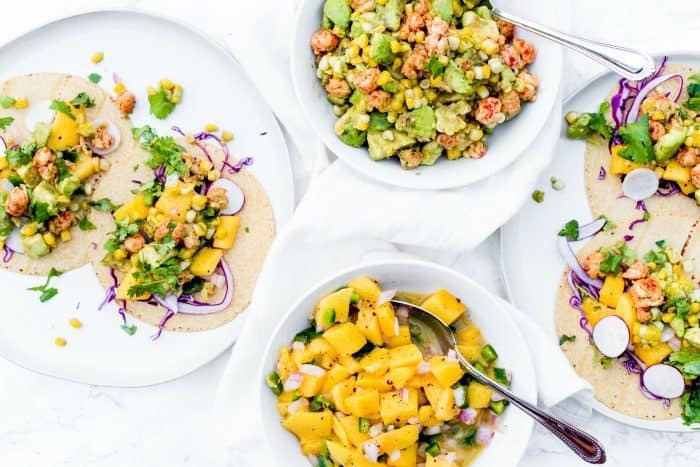 We love to serve an option of tacos or taco bowls (without the tortilla). 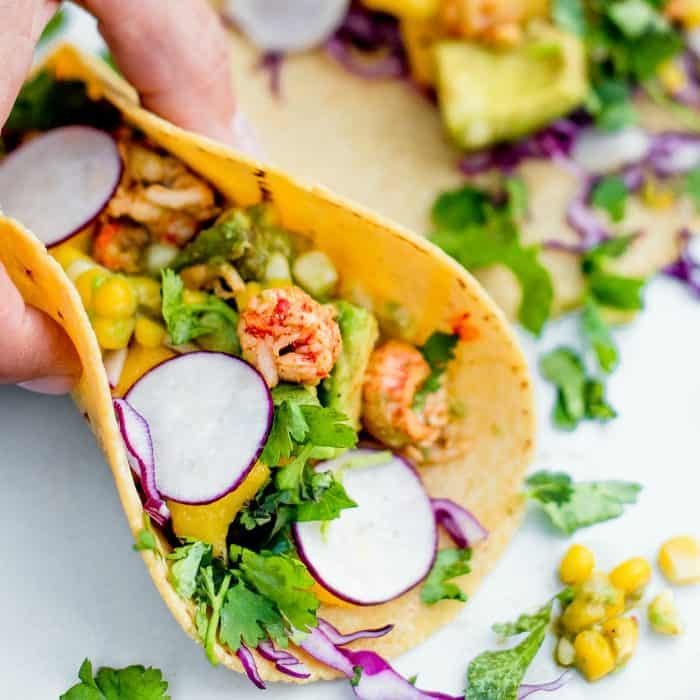 It only takes 4-5 minutes for lobster to cook, and flavor with taco spices! 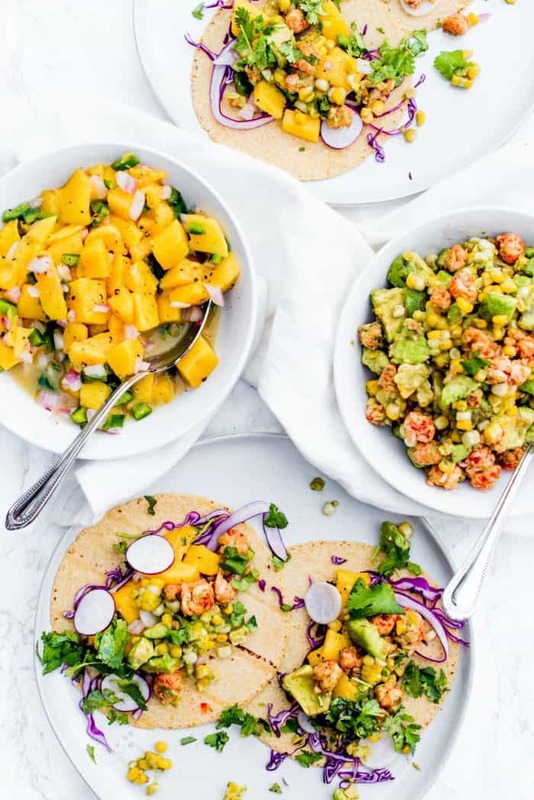 Set out your favorite toppings, such as thinly shaven purple cabbage, radishes, cilantro, and a yummy mango salsa, with corn tortillas. 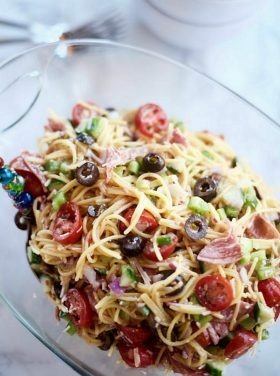 Delicious for the family or weekend hosting, there’s just something about giving yourself to cooking a meal for others. I wouldn’t trade my time in the kitchen with my daughter for anything. And guess what? 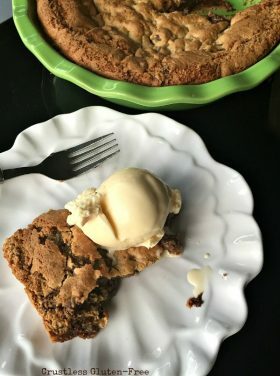 I love watching how creative Abby is with flavors, and I learn from her! In a medium skillet on medium-high heat, heat oil, then add in lobster meat, half of the lime juice, paprika, garlic powder, chili powder, and salt and pepper. 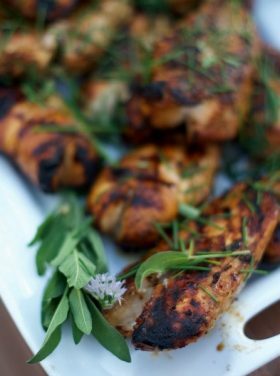 Cook for about 4-5 minutes, or until lobster is fully cooked (but not overcooked). 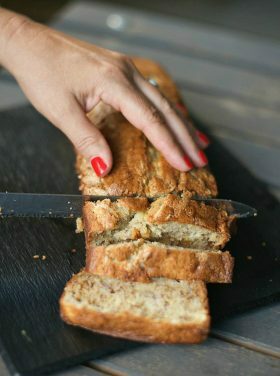 Remove from heat and allow time to cool. 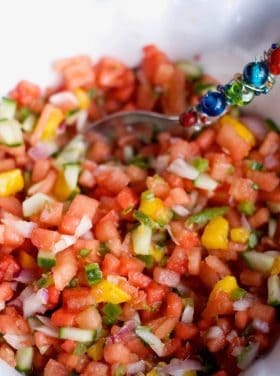 In a medium mixing bowl, add in cubed avocado, corn, remaining lime juice, and salt and pepper to taste. 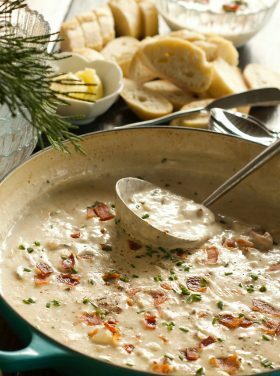 Add in the lobster meat and toss together. 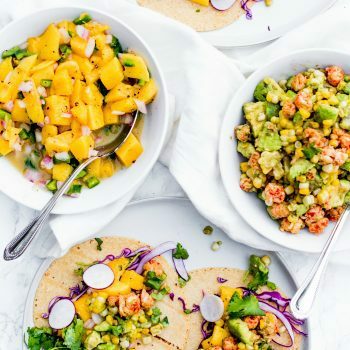 Serve with mango salsa, cabbage, cilantro, and radish on steamed tortillas. 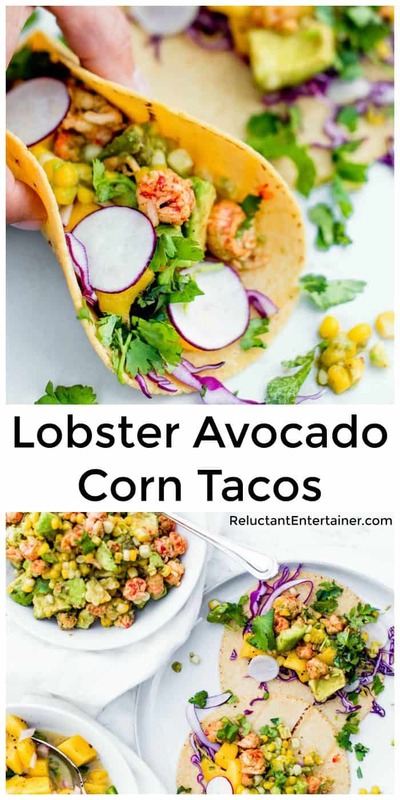 More Taco Tuesday recipes: Crock Pot Chicken Tacos [Valerier’s Kitchen], Best Grilled Rockfish Tacos [RE], and Dorito Taco Salad [Spend with Pennies].